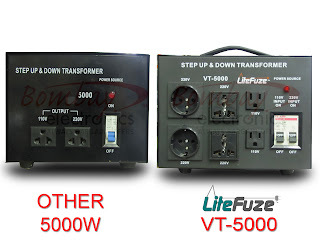 Why the LiteFuze LT-5000 is the best 5000 W voltage transformer in the market? 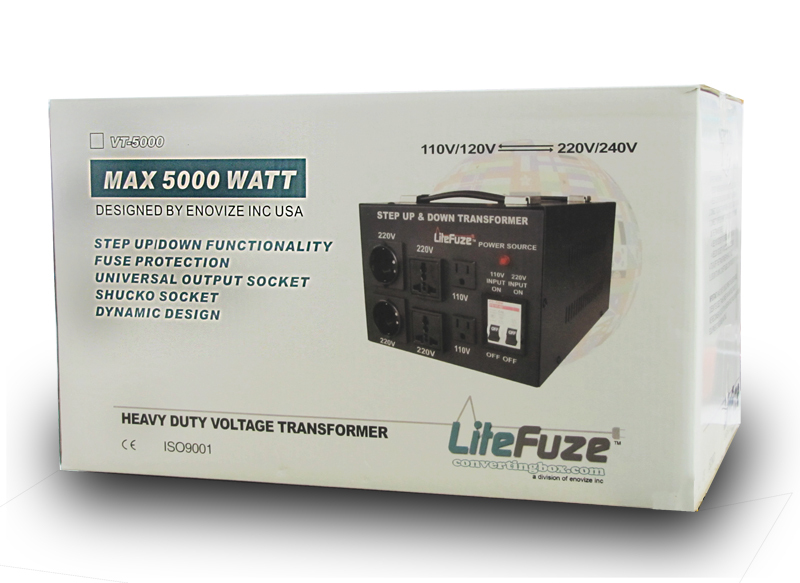 The LiteFuze LT-5000 has 4 output sockets for 220V products (2-Universal & 2-German/French Shucko) and 2 sockets for 110V products. 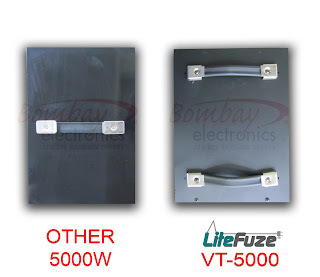 The other 5000 W has one socket for each voltage (220V & 110V). The LiteFuze LT-5000 has the input voltage switch built-in to the power switch. Switch ON 110V when using it in the US with 110V voltage or switch ON 220V when using it overseas in 220-240V countries. 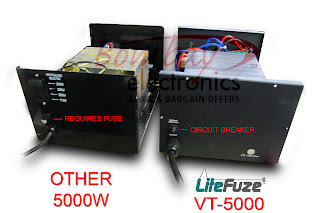 LiteFuze LT-5000 Dimensions (L x D x H) : 8.75" x 12" x 7"
Other 5000W Dimensions (L x D x H) : 8.25" x 12.5"
The LiteFuze LT-5000 has a built-in circuit breaker which trips if the transformer is overloaded so there is no need to replace fuses. 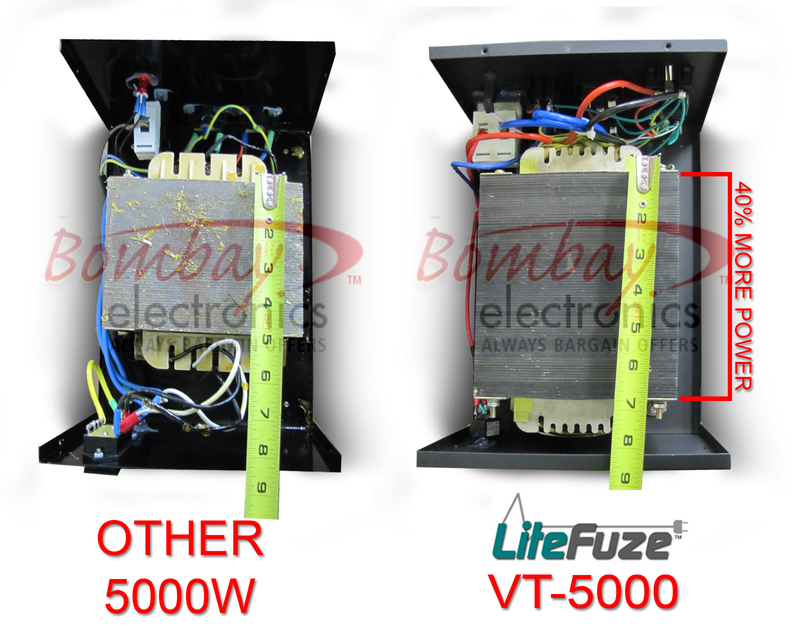 The other 5000 W uses replaceable fuses in case of overload. The input selection switch is also in the back of the transformer. The LiteFuze LT-5000 is equipped with two carrying handles on top to divide the weight of the unit and the unit weighs 52.91 lbs. 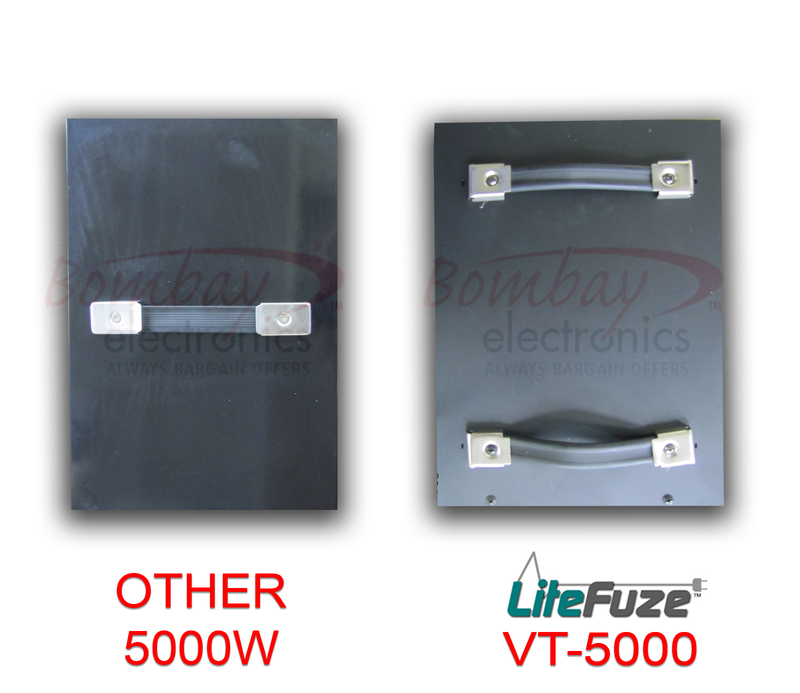 The other 5000 W is equipped with only one carrying handle and it weighs 40.78 lbs. 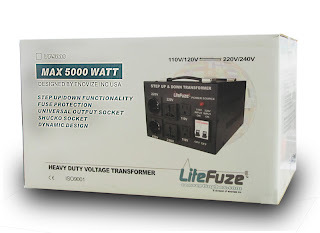 The LiteFuze LT-5000 is equipped with a 40% larger transformer which makes it more efficient and durable than the other 5000 w.
The efficiency factor of the LiteFuze LT-5000 is 1.5 and other 5000 W is 2.5. 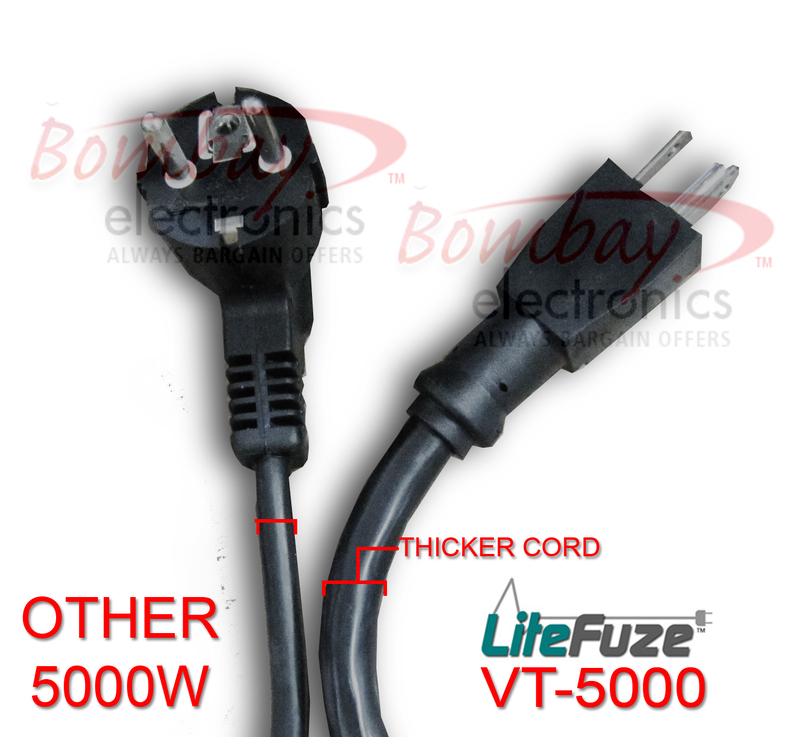 The LiteFuze LT-5000 has much thicker and industrial cord which is safer when the transformer is running at a high capacity. The cord length of the LT-5000 is 56" long and the other 5000 W is 21" long. 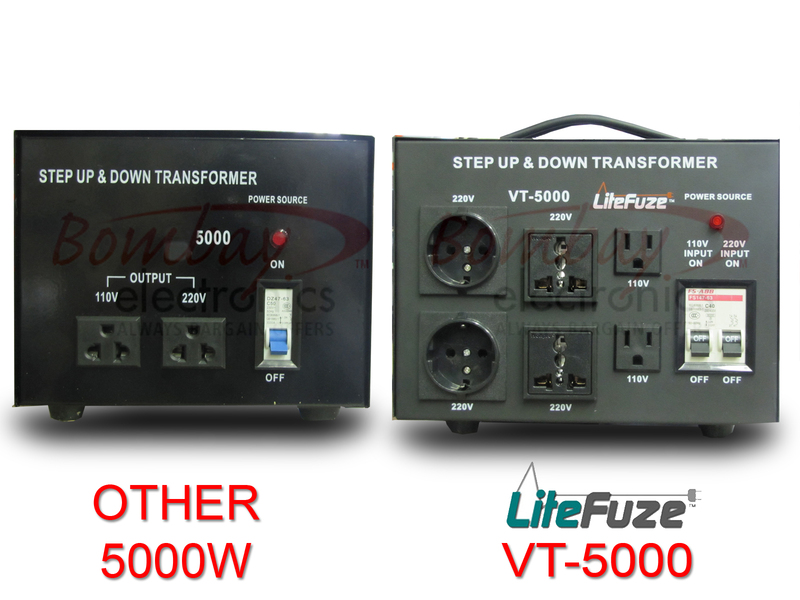 The VT-5000 is truly the best 5000w transformer on the market. We use them to support our Achi IR Pro SC systems. I was looking for a third unit and noticed that there is a slight name change to LT-5000. We have confirmed with Bombay that it's still the same great transformer. Thanks!